Politicians sometimes have the opportunity to manufacture their own facts until we the people call them what they are – lies. This parlour game has been played for centuries and is turning into a dangerous contact sport. On one side of the ring are spin doctors while at the other end are fact-checkers. There is a flourishing cottage industry of fact-checkers today but the Ministry of Truth, the parent company of spin doctors, is winning a few rounds. In January, a mere weeks into the Donald Trump presidency, the White House Counsellor accused journalists of bias, throwing out a titbit about a ‘Bowling Green Massacre’ that the media hadn’t covered. She was dead right. The media simply refuses to report on this kind of thing. 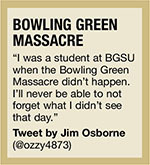 For starters, this gruesome ‘massacre’ never took place in the city of Bowling Green, Kentucky, otherwise known as the place where Corvettes are manufactured. White House Counsellor Kellyanne Conway didn’t make this stuff up – well, not exactly. There had indeed been two Iraqi refugees who were supposed to have been the ‘masterminds’ planning to attack a US army installation in Iraq in 2011. But fact-checkers found that there was neither a massacre nor any record of plans to attack the US. There’s a scientific way to deal with spin doctors who slip in code words and phrases like ‘alternative facts’ and ‘our sources tell us that…’ It involves making air quotes – a silly set of hand gestures right above your ears, drawing quotation marks in the air with two fingers of each hand. Tryit now – it may come in handy. Some of us practised this advanced non-verbal skill when ex-president George W. Bush claimed as a ‘fact’ that there were (insert ‘air quotes’ here) weapons of mass destruction hidden somewhere in Iraq. President Trump recently tossed an alternative fact about an event in Sweden, baffling the Swedes who didn’t know about it and probably began a thorough inspection of their Swedish meatball stockpile. Repeat a half-truth long enough and it slips into your bloodstream. Through a still-to-be-discovered vascular process, the infected corpuscles probably mutate into ideas that escape through one’s vocal chords as (insert ‘air quotes’ here) alternative facts. They take on a life of their own, funnelling through social media channels as (insert ‘air quotes’ here too) news. The great granddaddy of spin was Edward Bernays whose descendants work for corporations and dictators; and the PR industry understandably wants to distance itself from that rotten branch of the family tree (the Nazi minister of propaganda Joseph Goebbels was a follower of Bernays’ theory of manipulation that gave rise to the Third Reich). Alternative facts surfaced during the Watergate crisis when then-president Richard Nixon’s press secretary Ronald Ziegler attacked the media on behalf of his boss, labelling their work as “shabby journalism.” It’s funny now to recall that what he called a “third-rate burglary” was indeed the uber air quote during the Watergate scandal. And then there’s the firm Hill & Knowlton, which more or less pioneered the political fiction genre we call Fake News. In 1991, Hill & Knowlton manufactured a similar non-event about Iraqi soldiers (‘air quotes’ required here) ripping out babies from their incubators. They even offered an (‘air quotes’ here also) eyewitness account by a 15-year-old Kuwaiti girl. What they didn’t say was that the (‘air quotes’ here too) girl was a member of the Kuwaiti Royal Family. The spin was so good that even Amnesty International uncritically accepted the fake story although it later issued a retraction. So how bad could it become? Twentieth Century Fox recently created a fake online newspaper replete with fake stories to promote a movie about a fake cure that makes sick people even sicker. Let’s say you believe the sun rises in the east and is heading westward. You may be wrong! It could be an out-of-control burning mass of hydrogen coming dangerously close to Western countries. And that message was brought to you by the Ministry of Truth in a bid to stop an impending massacre. And no, you cannot quote me on this. Unless you promise to use air quotes! Let’s just put what Mr. Angelo says in the context of Sri Lanka. To begin with, it’s damn hard to trust what politicians say given the vested interests in galore. They essentially downplay or outright cloak up when anyone from their party blunders and blow out of proportion when anyone from their rival parties does something wrong. National newspapers seem only to be interested in selling opinions instead of facts, in addition to selling ads. If you check on the facts of the same news story on a couple of newspapers, you can see obvious discrepancies between the facts presented by each. Social media, in the meantime, is a hotbed of misinformation. They carry news from so many gossip news sites which seem to produce sensational political stories at an alarming rate. Trust me, there are people who are jejune enough to take them at face value. They just won’t stop there, but go on to spread the word around which seems to be an endorsement. Thus, as it is being spread around, even an obviously fake story gathers enough credibility measured by such shallow indicators like the number of likes, shares and comments. Of course, social media doesn’t have common sense as a validator of what they carry. The time-honoured ethics, principles and values of journalism seem to have been thrown out the window and journalism is beginning to look like an evolutionary offshoot of the PR industry rather than the other way around. There’s abundant evidence, however, to support the theory that this is a global phenomenon, not just a local one. It certainly begs the all-important question: what’s the role of media today?